Fatigue is a common affliction in our society, undermining happiness and lowering mood. You may sometimes feel too exhausted to enjoy the things you love or feel like you're left with no energy to make use of your free time. Alternatively, perhaps you’re working to find out how to raise your vibrational frequency for ascension and you're aware that exhaustion is holding you back. But how can you overcome fatigue, and are there realistic solutions that will make a quick difference to how you feel? If you want to overcome tiredness, this guide will help you make a plan that works. Whether you want to know how to fight fatigue at work, in your downtime or all throughout your life, we'll explore a wide range of concrete steps you can take to make a real difference. Even if you make just a few of these suggested changes, you should begin to notice an increase in energy over the coming weeks. It's easier to beat fatigue if you can identify some of its causes, as this helps you see where you need to make changes. Before going further, try writing a quick list of the things you think might be contributing to your own tiredness. 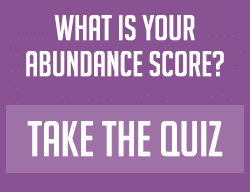 How Close Are You To Wealth & Abundance Right Now? Which one of these 10 common 'abundance blocks' are sabotaging the success you deserve? Click here and find out by taking this free 30-second quiz. While there’s no magic way to learn how to get rid of tiredness instantly, there are lots of small but powerful life changes you can make in order to boost your energy. And when you commit to living more healthily in this way, you change your vibration immediately. This creates a positive cycle; one that supports success, happiness, and emotional stability. As you read through the following nine techniques, think about how and when you might be able to incorporate them into your daily routine. Try to anticipate plausible obstacles, and think about how you will ensure you stick to your new habits. It can seem counterintuitive to work out when you're already tired, but research proves that regular exercise leads to an overall increase in energy levels. Just taking 15-20 minutes to go for a walk can make all the difference. If you haven't exercised recently, start with short sessions and aim to build up to around two and a half hours of cardiovascular exercise per week. Remember that it doesn't have to be boring; try out a wide range of approaches in order to find something that you enjoy. As well as the traditional options like jogging and cycling, think about swimming, aerobics, Zumba, and horse riding. When you try to beat fatigue, caffeine can seem like a friend at first. It gives you that little spike of energy you need to focus at work, drive home, or pay attention during a family gathering. However, there is evidence that dependence on caffeine contributes to fatigue, so try cutting it out over the course of a month and see if it makes a difference. You might find that you feel irritable or experience headaches at first, so be sure to reduce your intake gradually. Meanwhile, don't forget about less obvious sources of caffeine as well, such as painkillers, cold remedies, and sodas. Stress is exhausting, so if you look at the stress you can remove from your life then you'll soon find yourself with more energy. In addition, if you want to find out how to raise your vibration fast, reducing stress helps you do this in multiple ways. Obviously, there are some causes of stress that we can't avoid. However, if you have toxic friendships that are past their sell-by date or obligations that no longer suit you, consider moving on from these sources of negativity. Similarly, if you have a highly stressful job, ask yourself if there are any other career paths that could be just as satisfying but much less draining. It's vital to rule out medical causes of tiredness. For example, chronic fatigue syndrome symptoms can be a part of a further systemic illness like arthritis or lupus. Visit your doctor to discuss your tiredness, especially if you have extreme fatigue symptoms or episodes of sudden, extreme tiredness. Some basic blood work and an exploration of your symptoms should indicate whether there's any need for further investigation, and if you do end up with a new diagnosis then receiving treatment will hopefully put you on the path to reducing your fatigue. Meanwhile, ruling out illnesses can also reduce anxiety and provide reassurance. When it comes to fatigue treatment, good sleep hygiene is essential. For example, lists of home remedies to get rid of tiredness often refer to the importance of keeping your bedroom distraction-free. Aim to get 7-9 hours per night on average, and attempt to get up and go to bed at the same times each day. It's also a good idea to take time to relax directly before bed (e.g. by taking a hot bath or reading a book), as this will help you fall asleep more quickly and improve the quality of your sleep. In contrast, lots of screen time before bed is proven to fracture sleep. Sudden waves of tiredness can help you understand when you function best, helping you to make the most of your body clock. For example, plenty of people are sharp and productive in the morning, but others do their best work in the evening and into the night. It's difficult to change these patterns, even if you'd prefer to have one rather than the other because they're influenced by neurological and genetic facts. The best thing you can do is identify your peak times, and then schedule your most demanding tasks for during this period (while asking less of yourself at the times when you are more sluggish). In your quest to learn how to stop feeling tired, you might easily overlook the importance of regular eating. Crashing fatigue often strikes when blood sugar is low, so try eating every few hours instead of spacing out several big meals over the course of the day. Eating little and often will help to ensure you always have energy at your disposal, and it can encourage you to eat more healthily. Focus on fresh fruits, vegetables, and whole grains, and make sure you always get enough protein. Notice which foods seem to work best for you, and keep them as a key part of your diet. Tiredness and fatigue can also come with carrying excess weight, partly because it's harder work to move a larger body and partly because it puts more strain on your cardiovascular system. If you know that you could stand to lose some weight, you may feel more motivated if you focus on the fact that doing so will boost your energy levels. In addition, you'll likely feel more confident, and feeling better about yourself will also increase your vibration. Just remember to lose weight in a healthy, steady way by reducing food intake and increasing exercise. Crash diets only produce temporary results and reduce energy further. Finally, taking a critical look at your water intake is a key part of figuring out how to get rid of fatigue and weakness. You may be surprised by how often feelings of tiredness are caused by mild dehydration, which is easily cured by drinking a large glass of water. To see if dehydration is a common feature in your lethargy, plan to drink a set amount of water each day for a week and track any changes in mood and energy. If you do start to feel better, you've found a simple and effective solution to your problems!